“Bombay to Beijing by Bicycle”: got quite a nice ring to it thinks Russell, could be a punchy title for a travel book. Too bad Bombay is now called Mumbai, and to write a book about it he’ll have to actually do it. Russell McGilton is our tour guide for the duration of this play, taking the audience on a frenetic journey – a first-hand account unlike any you’d read in a Bill Bryson book or Lonely Planet guide. It’s completely unsanitised (in more ways than one), and all the better for it. Our journeyman sets out with confidence, but of course things quickly go awry. Helped out by a little bit of malaria we are ushered through feverish flashbacks. The infuriatingly curious, ever (un)helpful locals, the unfamiliar gastronomically volcanic cuisine, the toll of endless cycling on one’s bottom and balls. Factor in a holiday romance that outstays its welcome and a mosquito net that’s not big enough for two, and we begin to put the puzzle pieces together. Although this is a one man show we get to meet a vast array of eccentric characters. Russell slips easily into the skin of each, sometimes disconcertingly so. A stand-out is the absurdly cheerful Dr Chawla who greets our hero with “Congratulations. You are having the malaria”. This is a fun show. He might be ambivalent about bike touring through India, but you’ll find no such ambivalence here. Get on your bike and head to the Bakehouse, Russell will be telling tales until the end of the Fringe. The minimalist set favoured our performer’s animated impersonations, allowing McGilton to show off his dynamism in the form of fast-paced characterisations. It’s possible that th particularly tender sensibilities may be offended by renditions of enthusiastic monkeys or human gastroenteritis, but McGilton is just telling it as it is. Russell McGilton just wants to get himself from Bombay to Beijing by Bicycle. But things don’t go according to plan due to a bout of malaria, a battle with a cheeky monkey, a ‘stack with a yak’, being chased by wild dogs and his other half deciding to tag along for part of the journey. 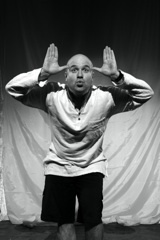 McGilton, in this one-man show, portrays a number of characters he encountered on his travels. With a white sheet as a backdrop, a couple of stools and a drink bottle as his only props, McGilton relies on distinct mannerisms and accents to distinguish between characters and tell stories. McGilton is great switching between each character and does each role convincingly. The audience laughed throughout.